Location. 34° 48.362′ N, 87° 37.89′ W. Marker is in Florence, Alabama, in Lauderdale County. Marker can be reached from Hightower Place 0.3 miles south of Veterans Drive (Alabama Route 133). Touch for map. Located in River Heritage Park. Marker is at or near this postal address: 10 Hightower Place, Florence AL 35630, United States of America. Touch for directions. Other nearby markers. At least 8 other markers are within walking distance of this marker. Oscar Stanton DePriest (here, next to this marker); Charles Caine Anderson (here, next to this marker); Frank Perron Achorn (here, next to this marker); Dr. Amit Roy (here, next to this marker); Lt. Col. R. Edward Yeilding (a few steps from this marker); Ronnie Gene Flippo (within shouting distance of this marker); James Thomas Rapier (within shouting distance of this marker); William Christopher Handy (within shouting distance of this marker). Touch for a list and map of all markers in Florence. More. 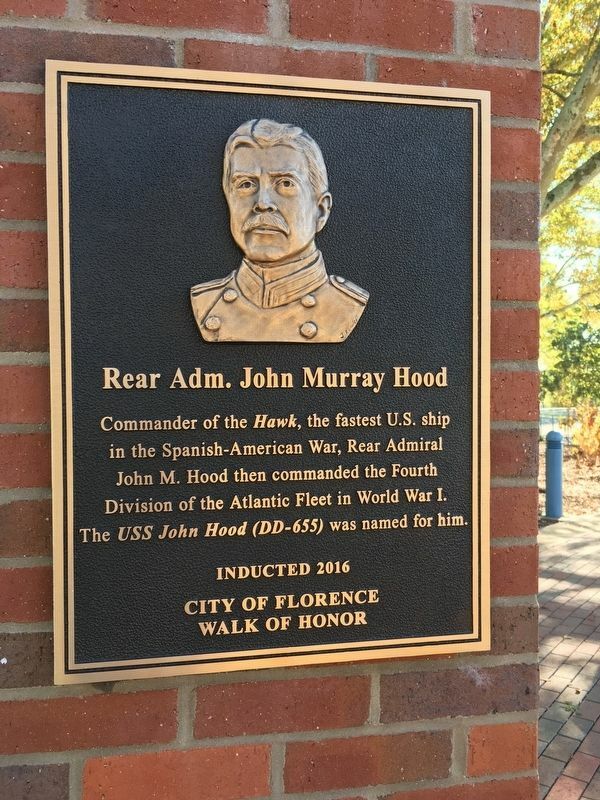 Search the internet for Rear Adm. John Murray Hood. Credits. This page was last revised on November 10, 2016. This page originally submitted on November 5, 2016, by Sandra Hughes of Killen, Usa. This page has been viewed 288 times since then and 14 times this year. Photo 1. submitted on November 5, 2016, by Sandra Hughes of Killen, Usa. • Bernard Fisher was the editor who published this page.